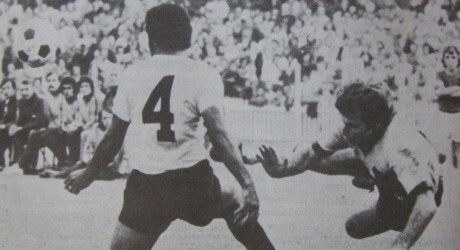 Ray Baartz heads goalwards against Uruguay in Sydney in 1974. Source: Sid Grant, Jack Pollard’s Soccer Records. Last week Uruguay won the Copa America for a record 15th time. Last year they came third in the World Cup in South Africa, having won the competition twice in 1930 and 1950. Brazil will host the World Cup in 2014 and Brazilians be quaking in their collective shoes that there will be no repeat of the disaster of 1950, when the Selecao was upstaged on its own soil. So it is no wonder that Australia’s clashes with Uruguay have been the toughest of encounters involving pure skill and the black arts of cynical defence and football politics, by both sides. The countries have met on nine occasions including four World Cup qualifiers in 2001 and 2005, but the first time they played was in preparation for the world Cup in West Germany in 1974, for which both nations had already qualified. The first game was played at Olympic Park in Melbourne on 25 April in front of 20,283 and ended as a tight goal-less draw. Two days later they met again in Sydney and Australia won by two goals to nil. Ray Baartz scored the opener after 59 minutes, but shortly thereafter he was felled by what is often described as a ‘karate chop to the throat’ by Luis Garisto. That ended Baartz’s World Cup participation as doctors concluded that a repetition could result in death or permanent injury. Peter Ollerton added a second goal with six minutes left to play and the visitors were not pleased with the result. They also put a lot of pressure on referee Don Campbell, but the Scot coped with it. Juan Masnik of Uruguay outjumps Peter Wilson and Gary Manuel in the match between Australia and Uruguay at Olympic Park in Melbourne in 1974. Source: Laurie Schwab, The Socceroos and their Opponents. In 1992 the Socceroos went on a three-match tour of South America the final one being against Uruguay in Montevideo. The home side reversed the previous scoreline with goals by Sergio Martinez and Alejandro Larrea late in the second half. Five years later the countries met for the first time in a tournament at senior level in the Confederations Cup in Saudi Arabia. Australia got through its group stage including a scoreless draw with Brazil and met a very young Uruguay side in the semi final. There were no goals in normal time, but Harry Kewell scored a golden goal two minutes into extra-time in the days when sudden death goals counted. The next four encounters were World Cup qualifiers not friendly matches. The first of these was in 2001, when Uruguay finished in fifth place in the South American group as a result of the last round of matches. The other possibilities would have been Brazil or Colombia. The first match was in Melbourne at the MCG with 84,656 fans in attendance and was settled by a Kevin Muscat penalty after Paul Agostino had been pushed over as he ran in on goal. That was not enough of a lead to take to Montevideo. Dario Silva scored after only 14 minutes and Australia had to chase the game. Even when substitute Richard Morales scored the first of his two goals in 70 minutes a goal to Australia would have put the Socceroos through on away goals, but in pressing hard for it they copped a third goal in the 90th minute also by Morales. In 2005 the two countries met again, this time with the first leg in Uruguay. Much skullduggery off the field involved the timing and conditions for the matches, but the Socceroos were lucky to have Qantas sponsorship and a chartered plane to fly home immediately after the first match. ‘Lucky Guus’ Hiddink was in charge and he and the Socceroos managed to restrict the Uruguayans to a single goal lead in the Montevideo leg. Dario Rodriguez got that goal after 35 minutes. The second leg began with Uruguay threatening in front of 82,698 at Homebush in Sydney. Tony Popovic was lucky only to be yellow carded for coat-hangering Alvaro Recoba. Hiddink pulled him off and sent on Harry Kewell in the 31st minute. The talisman took only four minutes to make an impact, shanking an effort which fell into the path of Marco Bresciano who finished it off. There was no further score in normal or extra time and Hiddink was planning to bring on Zeljko Kalac if the game went to penalties. However, an injury to Brett Emerton meant that Josip Skoko came on for the last ten minutes as Australia’s third and final substitute. The other was one John Aloisi. 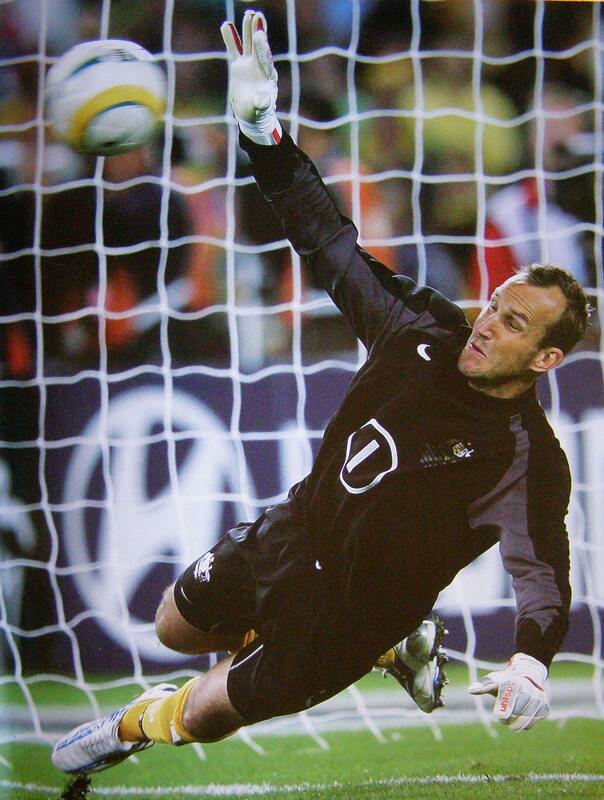 So Mark Schwarzer had to repeat his Canadian heroics by saving two penalty kicks, Mark Viduka’s blushes and paving the way for Aloisi to do his Brandy Chastain impersonation, minus the bra. In 2007 Uruguay came back to play a friendly match in Sydney which they won by two goals to one, the second being a header by Recoba after an error by Brad Jones, deputising for Schwarzer. Diego Forlan scored the first for Uruguay and Mile Sterjovski got Australia’s opener after only six minutes. Forlan only played in a couple of times against Australia, but he was the best player in the World Cup in South Africa and was the third member of his family to win the Copa America, as his father and grandfather had also done so. So two countries with very different football pedigrees have shared honours (and dishonours) in head-to-head competition since 1974. 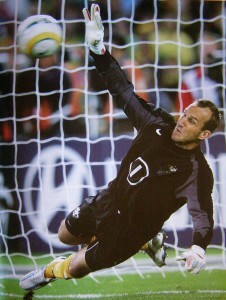 Mark Schwarzer saves a penalty against Uruguay at the Olympic Stadium in Sydney in 2005. Source: Mark Schwarzer’s World Cup Destiny. Getty Images/Cameron Spencer. Australia 0 Uruguay 0, Olympic Park, Melbourne, 25 April 1974, friendly. Crowd: 20,283. Australia: Jack Reilly, Doug Utjesenovic, Peter Wilson, Manfred Schaefer (Adrian Alston 37), Col Curran, Jim Mackay, Ray Richards, Jim Rooney, Ray Baartz, Gary Manuel (Peter Ollerton 62), Branko Buljevic. Coach: Rale Rasic. Uruguay: Hector Santos, Mario Gonzalez, Walter Olivera (Gustavo De Simone 46), Juan Masnik, Mario Zoryez, Julio Jimenez, Denis Milar (Walter Mantegazza 62), Alberto Cardaccio, Juan Ramon Silva, Fernando Morena, Ruben Corbo. Coach: Roberto Porta. 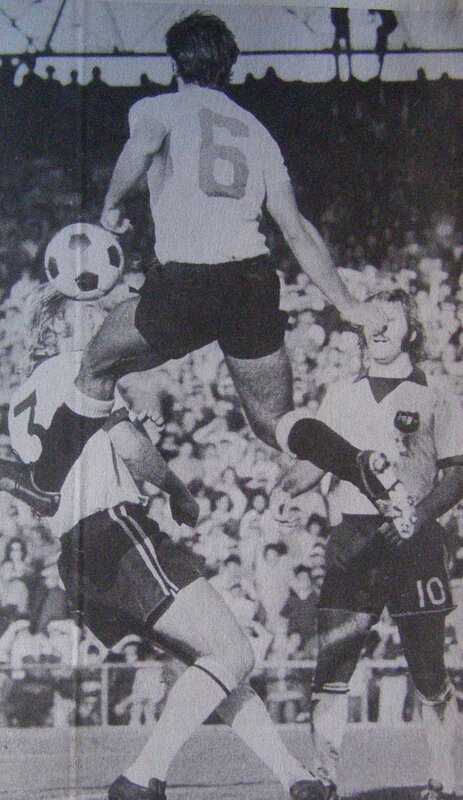 Australia (Ray Baartz 59’, Peter Ollerton 84’) 2 Uruguay 0, Sydney Cricket Ground, 27 April 1974, friendly. Crowd: 25,708. Australia: Jack Reilly, Doug Utjesenovic, Peter Wilson, Ray Richards, Col Curran, Jim Rooney, Dave Harding, Jim Mackay, Ray Baartz (Adrian Alston 76), Atti Abonyi, Peter Ollerton. Coach: Rale Rasic. Uruguay: Gustavo Fernandez, Mario Gonzalez, Gustavo De Simone, Luis Garisto (sent off 76), Mario Zoryez (Juan Ramon Silva 83), Julio Jimenez, Walter Mantegazza, Alberto Cardaccio, Jose Gomez (Dennis Milar 68), Fernando Morena, Ruben Corbo. Coach: Roberto Porta. Uruguay (Sergio Martinez 74’, Alejandro Larrea 84’) 2 Australia 0, Estadio Centenario, Montevideo, 21 June 1992, friendly. Crowd: 18,000. Uruguay: Roberto Siboldi, Cecilio De Los Santos, Daniel Sanchez, Fernando Kanapkis, Nelson Cabrera, Jorge Barrios, Jose Luis Salazar, Marcelo Saralegui, Adrian Paz (Diego Dorta 78), Alejandro Larrea, Gerardo Miranda (Sergio Martinez 46). Coach: Luis Cabilla. Australia: John Filan, Andrew Marth, Mehmet Durakovic, Milan Ivanovic, Alex Tobin, Paul Wade (c), Vlado Bozinoski, Ernie Tapai, Mike Petersen, Warren Spink (Alastair Edwards 71), Jason van Blerk. Coach: Eddie Thomson. Australia (Harry Kewell 92’) 1 Uruguay 0, King Fahd Stadium, Riyadh, Saudi Arabia, 19 December 1997, Confederations Cup semi-final. Crowd: 22,000. Australia: Mark Bosnich, Milan Ivanovic, Stan Laazridis, Alex Tobin (c), Tony Vidmar, Ned Zelic, Craig Foster, Aurelio Vidmar (Josip Skoko 81), Kevin Muscat, Mark Viduka, Harry Kewell. Coach: Terry Venables. Uruguay: Claudio Flores, Luis Lopez, Paolo Montero, Gustavo Mendez, Edgardo Adinolfi, De Los Santos, Pablo Garcia, Liber Vespa, Alvaro Recoba (Debray Silva 81), Marcelo Zalayeta, Andres Olivera. Coach: Victor Pua. Australia (Kevin Muscat Penalty 79’) 1 Uruguay 0, MCG, 20 November 2001, World Cup qualifier, first leg. Crowd: 84,656. Australia: Mark Schwarzer, Kevin Muscat, Shaun Murphy, Craig Moore, Tony Vidmar, Brett Emerton, Paul Okon (c), Josip Skoko, Stan Lazaridis (Paul Agostino 46), Mark Viduka, Harry Kewell. Coach: Frank Farina. Uruguay (Dario Silva 14’, Richard Morales 70’, 90’) 3 Australia 0, Estadio Centenario, Montevideo, 25 November 2001, World Cup qualifier, second leg,. Crowd: 62,000. Uruguay: Fabian Carini, Washington Tais, Alejandro Lembo, Paolo Montero (c), Dario Rodgriguez, Pablo Garcia, Gianni Guigou, Mario Reguiero (Gonzalo de los Santos 74), Alvaro Recoba, Federico Magallanes (Richard Morales 65), Dario Silva (Gonzalo Sorondo 82). Coach: Victor Pua. Australia: Mark Schwarzer, Kevin Muscat (Paul Agostino 73), Shaun Murphy (John Aloisi 81), Craig Moore, Tony Vidmar, Brett Emerton, Paul Okon (c), Josip Skoko, Stan Lazaridis, Mark Viduka, Harry Kewell. Coach: Frank Farina. Uruguay (Dario Rodriguez 35’) 1 Australia 0, Estadio Centenario, Montevideo, 12 November 2005, World Cup qualifier, first leg. Crowd: 55,000. Uruguay: Fabian Carini, Diego Lopez (Guillermo Rodriguez 63), Paolo Montero, Dario Rodriguez, Carlos Diogo, Pablo Garcia, Diego Perez, Alvaro Recoba, Diego Forlan (Dario Silva 18), Marcelo Zalayeta (Fabian Estoyanof 63), Richard Morales. Coach: Jorge Fossati. Australia: Mark Schwarzer, Lucas Neill, Scott Chipperfield, Tony Vidmar, Tony Popovic, Brett Emerton, Mark Viduka (John Aloisi 80), Harry Kewell, Vince Grella, Archie Thompson (Marco Bresciano 52), Jason Culina. Coach: Guus Hiddink. Australia (Marco Bresciano 35’) 1 Uruguay 0, after extra-time, Olympic Stadium, Sydney, 16 November 2005, World Cup qualifier, second leg. Crowd: 82,698. Australia won on penalties by four goals to two. Australia: Kewell, Neill, Vidmar, Viduka (miss), Aloisi. Uruguay: D Rodriguez (saved), Varela, Estoyanoff, Zalayeta (saved). Australia: Mark Schwarzer, Lucas Neill, Scott Chipperfield, Tim Cahill, Tony Vidmar, Tony Popovic (Harry Kewell 31), Brett Emerton (Josip Skoko 110), Mark Viduka, Vince Grella, Jason Culina, Marco Bresciano (John Aloisi 96). Coach Guus Hiddink. Uruguay: Fabian Carini, Diego Lugano, Dario Rodriguez, Paolo Montero (Marcelo Sosa 81), Perez Pablo Garcia, Guillermo Rodriguez, Gustavo Varela, Carlos Diogo, Alvaro Recoba (Marcelo Zalayeta 73), Mario Regueiro (Fabian Estoyanoff 97), Richard Morales. Coach: Jorge Fossati. Australia (Mile Sterjovski 6’) 1 Uruguay (Diego Forlan 40’, Alvaro Recoba 77’) 2, Olympic Stadium, Sydney, 2 June 2007, friendly. Crowd: 61,795. Australia: Brad Jones, Lucas Neill, Patrick Kisnorbo (Danny Allsopp 84), Michael Thwaite, Brett Emerton, Carl Valeri, Jason Culina (Nick Carle 70), Luke Wilkshire, Mile Sterjovski (Ryan Griffiths 55), Brett Holman (Archie Thompson 62), Scott McDonald. Coach: Graham Arnold. Uruguay: Fabian Carini, Diego Lugano, Pablo Garcia, Dario Rodriguez, Cristian Rodriguez, Carlos Diogo, Alvaro Recoba (Fabian Cannobio 83), Diego Perez (Guillermo Giacomazzi 46), Andres Scotti (Jorge Fucile 26), Diego Forlan (Fabian Estoyanoff), Vicente Sanchez. Coach: Oscar Tabarez. Data from Ozfootball website, Laurie Schwab, The Socceroos and their Opponents, Rothman’s Football Yearbooks. ← What happened to the locusts?